If you’re in business today, you’ve probably at least heard of inbound marketing. You may have thought about looking into it. And if your current marketing efforts are doing the job—that’s great! The reality is that your life—both professionally and personally—has felt the impact of inbound marketing, whether you are consciously aware of it or not. How familiar are these scenarios? Have you looked up something on Google and clicked a link to go to an offer on a website? Has an ad “followed you around” as you surf the internet, piquing your interest in a product, or making you aware that there even was a product that could provide you with a better outcome than your present situation? How many times does it happen that you read an article and keep clicking on the links within it to get even more information than you started out with? When scrolling through your personal Facebook page, have you seen ads that are more geared towards your profession, personal hobbies, or business? Has a prospect contacted you based on information that was found on your website? Each scenario above has inbound marketing fingerprints all over it! Before we begin this discussion about switching your B2B company over to inbound marketing strategies, we should probably talk about what inbound marketing is. Inbound marketing has gained massive traction in the 10 years that the phrase was coined by the founders of HubSpot. A main principle of it is to provide value to buyers with information that is more educational than “salesy,” and to do so in a way that is not “disruptive.” Adoption of this method is growing, naturally, because of our increasing dependence on the internet for virtually every aspect of our lives. 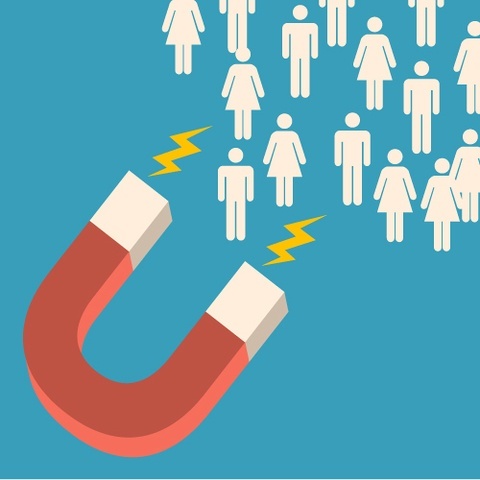 So buyers can easily find the information they are searching for, practices like search engine optimization, defining buyer personas, and running “nurturing campaigns” are some of the tools companies use to attract potential customers. And it can be very targeted based on what they are looking for at that specific time. Quite simply, inbound marketing methodology works because it is tailored to customers. This helps visitors to self-identify as your customer before contacting you, which helps deliver qualified leads to your digital door. Outbound marketing is a traditional form of marketing that focuses on getting news about a product or service to everyone (and anyone) without filtering the information based on types of people and what the customers are looking for. Common examples are billboards, cold calls, pop-up ads, and more. The goal of these advertisements is to broadcast a product to as many people as possible in hopes of attracting one or two people to buy whatever is being sold based on a phone call or magazine ad. Outbound is also called “interruption” marketing, and as the world develops with new technology, consumers are paying less attention to the pop-up ads and posters on buses; they are more engaged with the internet, now constantly at everyone’s fingertips. As digital delivery and engagement grows, the filtering of content is becoming more specific as well. Tactics such as caller ID and spam folders are used to sift through an individual’s notifications and separate the ones that have no interest to that person. Because of the availability of new ways to block unwanted information, the overall process of buying, marketing, and selling has taken a different direction. With tools like adblock and recordable and streaming programming on TV and mobile devices, people are finding ways to avoid the content they don’t want to see. According to Jannelle Chemko of Umami Marketing, 45% of direct mail is not opened, 86% of TV ads are fast forwarded through, and only 1% of cold calls turn into appointments. Nowadays, most people do their shopping online. They look at reviews and blogs before committing to something—especially if it is expensive. This buyer’s model has now permeated the B2B market. This requires having quality content at all levels of the buyer’s journey. Tell the customers what they want to know (what they searched for to find you in the first place), not what you think they want to know (you selling, selling, selling). Also, by adding quality content, your information is more likely to come up as a top search result. 3. Inbound marketing is cheaper! You want to save money and make money, right? Outbound marketing focuses on spreading information to anyone who will listen, and companies can invest thousands of dollars and not get enough back using the traditional marketing strategy. On average, inbound leads cost 62% less than outbound leads. Remember—inbound brings in more qualified leads, so potential buyers are more educated, further down the funnel, and more prepared to make a buying decision by the time they engage with you. And all that content you create—think of it as an asset your business owns that will keep attracting visitors perpetually once the initial work to create it is done. 4. The competition is doing it already! The average budget spent on inbound marketing has doubled in the last couple years and most of them have gotten at least one customer from Facebook, Twitter, company blogs, LinkedIn, and more. In HubSpot’s State of Inbound 2017 report (which surveyed over 6,000 marketers worldwide), the top “overrated marketing tactic” was noted as paid advertising: print, outdoor, broadcast. Globally, 71% of respondents said that inbound marketing is their organization’s primary approach to marketing (76% in North America). If this marketing strategy is working and benefiting your competitors, might that not be reason enough to switch?